November is just around the corner, which means it is the right time to start making plans for the holiday lighting that will illuminate your home this winter season. Creating the ultimate winter wonderland in your outdoor space isn’t an easy task, so you may want to consider using a professional outdoor lighting service this year. 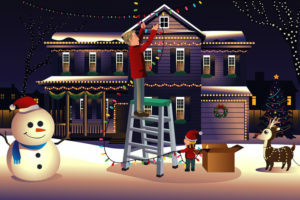 Rather than trying to balance at the top of your ladder to reach every tree branch or hang icicle lights from your garage, let a team of experts transform your home and make your property the one everybody notices as the sun sets each night. LED lights differentiate themselves by providing the same amount of light as incandescent bulbs while using about five to eight times less power. In fact, a single LED bulb last far longer than any other source of light. Many outdoor LED bulbs promise up to 60,000 hours of usefulness, which is 7 full years of continuous operation or 12 years of nighttime use. By using LEDs, you can make a long-lasting investment and enjoy lower energy bills during the holiday season. When you work with Decorating Elves, Tampa’s premier outdoor lighting company, our experts will identify the best architectural features of your home and emphasize them using beautiful lights. If you have a bay window, attic steeples, or any other defining feature, we will make sure to give them the eye-catching, colorful lighting that will best help your home shine. Tree trunks and walkways should never be ignored. We will wrap the trees and branches of trees by starting at the bottom and spiraling the lights around. There’s no end to the creative ideas possible to help your trees and walkways stand out. From small path light stakes to dramatic candy cane lights, we will illuminate your property to make it unforgettable. The decorations and lighting used around your entryway can transform your holiday lighting from great to awe-inspiring. The experienced lighting designers and technicians at Decorating Elves have both the art and science of holiday lighting mastered so your entryway looks nothing short of magical. This might include a shining snowman with illuminated gifts next to the door, tall evergreens flanking each side of the porch, or anything else you desire. Call Decorating Elves today at (727) 418-4127 to schedule your professional lighting appointment and get your home ready for the holiday season.